Gov. John Kasich of Ohio is reported to have proposed freezing U.S. military aid to Israel while he was serving on the House Budget Committee, a recommendation that would make him an outlier in the 2016 Republican primary field. The proposal is said to have been included on a list of potential budget cuts to offset the tax deductions advocated by House Republicans in the 1990s. Kasich, who was the highest ranking Republican on the House Budget Committee at the time, proposed the list of cuts in conjunction with the House GOP’s "Contract With America," the Philadelphia Enquirer reported on Nov. 17, 1994. The deductions are reported to have included privatizing the air traffic control system, replacing Medicaid with "managed care programs," and cuts to foreign operations. "The plan also would freeze military aid to Egypt and Israel," the Philadelphia Enquirer reported. Kasich’s presidential campaign could not confirm the report or provide a copy of the list of budget cuts cited in the article. A spokesperson for Kasich declined to comment. The Republican presidential field largely supports aid to Israel, although Sen. Rand Paul (Ky.) has proposed cutting U.S. foreign assistance to all countries, including Israel. Kasich’s website describes him as "a consistent supporter of American efforts to support Israel’s military, including support through the annual Foreign Operations Appropriations Bill." Kasich, who served in Congress for 18 years, has had a relatively consistent record of support for Israel throughout his career. However, as a fiscal hawk, he has targeted Pentagon and foreign operations spending, which has occasionally pitted him against the defense community. Early in his career, Kasich clashed with the administration of George H.W. Bush over his opposition to the B-2 bomber, which he still describes as prohibitively expensive. Kasich’s stance against increasing the size of the B-2 bomber fleet continues to irk some defense hawks. "[F]rom an economic standpoint, I could see where [Kasich] made that decision. But from a military standpoint, we would have been better off with a larger buy of the B-2," retired Air Force General Chuck Wald told the Columbus Dispatch in July. Kasich also fought for cuts to the Pentagon budget throughout the 1990s while serving on the House Budget Committee and the House Armed Services Committee. Kasich and Rep. Timothy Penny (D., Minn.) proposed an estimated $26 billion in defense cuts in 1993, sparking an outcry from the defense establishment and claims from then-Secretary of Defense Les Aspin that the plan would gut military morale. Kasich also petitioned House Speaker Newt Gingrich in 1996 for additional Pentagon budget deductions, saying, "I believe there are enormous savings in that building." Some of Kasich’s budget cut proposals as governor of Ohiohave generated criticism as well. Shortly after he took office in 2011, his administration said that it would close its trade office in Israel, which encourages commerce between Israel and Ohio. The plan was shelved after objections from two former governors and pro-Israel leaders, and the Israel trade office remains open today. Despite Kasich’s support for defense cuts, he has also taken a tough line on national security. He recently criticized the Obama administration’s nuclear deal with Iran and said that as president he would work to reinstate U.S. sanctions after taking office. 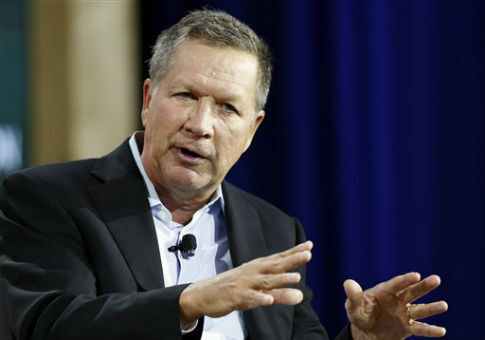 Kasich has also called for sending U.S. troops to Iraq to fight the Islamic State. Kasich spoke at the 2014 Republican Jewish Committee meeting, where he was received warmly. He also flew to Washington, D.C., last March to support Prime Minister Benjamin Netanyahu’s speech to Congress. According to Kasich’s website, the governor supports an undivided Jerusalem and U.S. military cooperation with Israel. He also opposes unilateral declarations of statehood by the Palestinian Authority. Although many Israel advocates support U.S. aid, some oppose it because they believe it makes the Israeli military beholden to the United States government. Israel receives around $3 billion in military aid each year, much of which is used to purchase U.S.-made defense equipment. American foreign assistance to all countries makes up about 1 percent of the U.S. federal budget annually. This entry was posted in Politics and tagged 2016 Election, Israel. Bookmark the permalink.